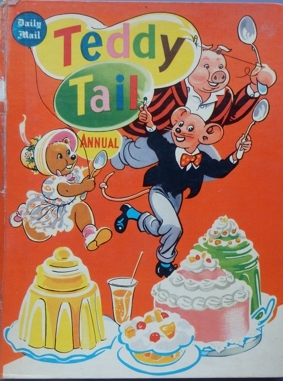 TEDDY TAIL ANNUALS from 1956-1960 and the later Teddy Tail Fun Book. 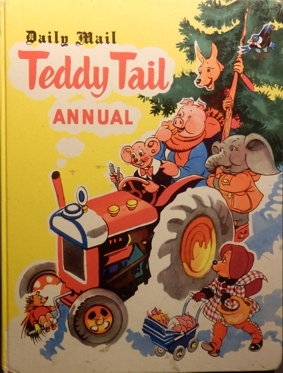 It seemed sensible to try and establish the order of publication of the post war Teddy Tail Annuals which weren't dated. To do so they were studied for clues, and Donnatilla who contributed illustrations and others were asked. 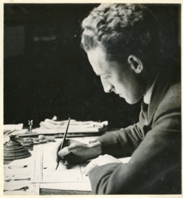 Unfortunately although we have W.St J Glenn's diaries for 1954 and 1955 there is a gap until 1962, although there are some letters. Another tool is to look at the black and white pictures in the newspaper and see the dates these were published to get some idea of sequence, as some stories appeared also in the annuals in colour. This seems to be the right order. Teddy is holding a balloon with Piggy and Tottie Bear at a party. The background is orange. There are 97 pages. “Daily Mail” is written in Gothic Script” as on newspaper. There is no price of book seen. This annual also features the Whiskertown Flier/Flyer-a veteran railway loco. created by Glenn for Whiskertown (page 84...) and Dr Beetle's vintage car on page 8 and Daniel the Spaniel(page 29). P 34: And what do YOU think ? P67: When I'm doing Homework. P73: Birthdays for all my Friends. P82: When I go to School. Teddy is holding a large umbrella. He is with his friends on skates. The background is yellow. There are 97 pages. “Daily Mail” is written in Gothic Script. It has a price on inside showing it cost 6/6d. 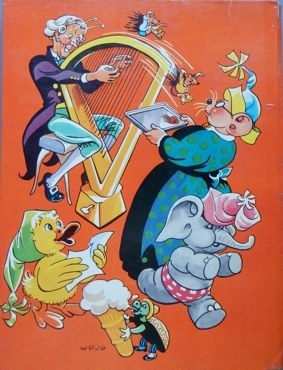 The flyleaf of the Daily Mail’s “Girls’ Annual” says of the Blue Spot Annual “ A new and delightfully illustrated Annual…Rumpelstiltskin…7/6 “ and lower down the flyleaf it says: ”Daily Mail Teddy Tail Annual. This beautifully-produced Annual….”6/6 . 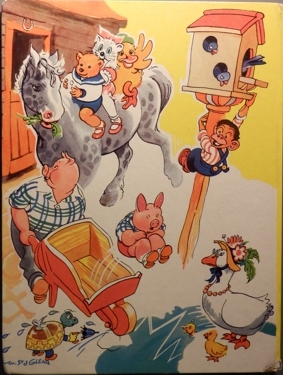 The first Blue Spot Annual, with a story about Rumpelstiltskin, was published in 1957. P43. Christmas Eve in Whiskertown. P71. When I'm a Grown up Lady. Teddy is driving a tractor in the snow and his friends are nearby. The cover is signed on the back. The background is yellow. There are 81 pages. The cost is printed inside as 7/6d, The “Daily Mail” is in Gothic Script. 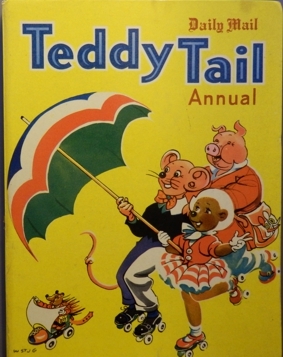 The flyleaf for the Blue Spot Annual published in 1958 gives the cost of the Teddy Tail Annual, and the price is printed inside the annual as 7/6d . The numbering on the first story suggests it was in the newspaper. It's called “One Good Turn” and is about making “go carts”. 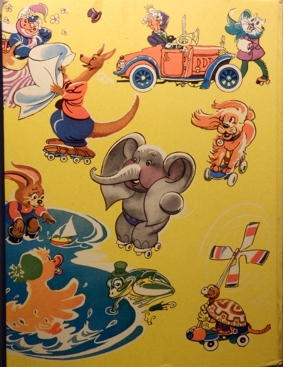 This theme of go carts is on the cover of the next Teddy Tail Annual with bubble blowing as well. W. St J. Glenn says in 1961 when negotiating with the Daily Mail:” Mrs Whisker's cottage I modelled from a real one in Gloucestershire, replacing something vague.” This is the first annual to show influences of Gloucestershire which slowly grew in the background and that Glenn first visited on holiday in 1957. There is a numbered story called “Whiskertown Flyer”about competition between a train and a cheaper coach. The train, in a more elaborate style features on the cover of the later Fun Book. Binkie illustrated a poem on page 24 “Dressing up the Christmas Tree” and a piece on page 36. P:35 Bo-Peep has lost a lot of things. P 38-39. A better way to use your paints.